But in addition to visiting us, we’d love for you to volunteer! Join us in an indoor booth to help table, flyer, and sell books for the PLP. – make some money (Bruno’s been stocking good hardbacks for us to sell)! Just put on your PLP t-shirt (if you have one!) and show up with your usual enthusiasm, ready to table, hand out flyers & bookmarks, and sell a book or a PLP t-shirt. 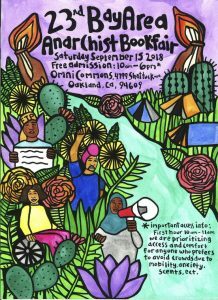 You’ll get to meet lots of other book lovers and community activists — and enjoy the passing parade! We need one or two people to coordinate throughout the day and would ideally like at least two additional volunteers throughout the day. So sign up for a shift or two! Team up with a friend and work a shift together — or sign up singly to meet some other PLPers.